A neat little 'gentleman's' travelling alarm lantern clock came to light recently, made by John Holland of London. John Holland is not a well-known name. A little research established that he was born about 1747 in Billesley, Warwickshire, the son of John Holland, 'gentleman' of that place. He was apprenticed in London through the Clockmakers' Company in 1761 to Thomas Radford for seven years for a 'premium' (a fee to cover his clothing, etc.) of £21.00. His brother, William Toller Holland, three years his junior, was apprenticed to the same master in 1764, for the same period and the same premium. John would have finished his apprenticeship by 1768, but probably worked on for his master for some years after that. He is first heard of working in his own right in 1777. Nothing more is heard of William Toller Holland, so perhaps he worked for his elder brother, John. Thomas Radford himself came from Horninglow, part of the town of Burton-on-Trent, Staffordshire, the son of James Radford. Thomas had been apprenticed in London through the Clockmakers' Company in 1732 to John Rogers, and then was made free in 1749. Radford worked in Gray's Inn Lane, where he died in 1774. It looks as if John Holland succeeded his master there. John's first being documented as working in his own right in 1777 is consistent with Radford's death in 1774, and John Holland is later recorded in directories from 1799 to 1804 as of Gray's Inn. 1. Front view of the arched dial miniature travelling alarm timepiece. The dial measures five inches by seven inches. The clock is a two-hander. Thomas Radford's first apprentice had been Thomas Hewitt or Hewlett, bound in 1749, he being the son of Richard Hewitt of Burton-on-Trent. So Radford came from Staffordshire and evidently kept up his connections in that locality by taking one apprentice from there and two (the Hollands) from nearby Warwickshire. It was fairly normal for those clockmakers, who originated in the provinces but made their careers in London, to keep in touch with their old home ground. We often find that these craftsmen who became 'Londoners' would take as their apprentices the sons of friends, neighbours or relations back in their own home locality, giving these country youngsters the same chance they themselves had to make a start on the London ladder of success. Little is known of the work of John Holland. The clock by him pictured here dates from the 1770s and is a neat example of a miniature travelling lantern clock with alarm of the very type that the gentry, such as John's own father, would take with them on their journeys. Such a clock was sometimes provided with a special wooden carrying box, though these very rarely survive today. This kind of clock could be hung from any suitable nail in the wall in a room in a tavern, or in the bedroom of a private house if the owner was staying with friends. This one is in surprisingly complete and original condition, with its original verge pendulum and its hanging hoop and spurs. The verge pendulum was almost always used on such clocks because it was attached to the clock and the whole thing was conveniently portable. A long pendulum would have been separately attached and would be a real nuisance when travelling, needing to be carried as a separate piece. This clock is a miniature example, just about as small and neat as they get, with a dial measuring five inches by seven inches. Larger examples (dials seven inches by nine inches) do exist but these were probably for a 'static' use rather than for travelling. For today's collector a miniature (travelling) version is far more desirable and is much scarcer to obtain. 2. 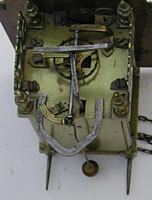 View from above with the bell removed to show the verge escapement and the double-headed alarm hammer. Although it has an arched dial, like a tiny longcase dial, this is still a true lantern clock with turned pillars, side doors and side frets. A hook-and-spike clock, with plain pillars or plates and neither frets nor side doors, would have been a more commonplace and cheaper option, and would be less desirable today. Those such as that by John Holland are usually called 'timepiece alarms' or 'arched-dial timepiece alarms'. Earlier examples of these travelling alarm clocks usually had just a single hand, since the need for time was met precisely enough by the nearest quarter hour's indication, and it was really its alarm function that was the vital aspect for the owner. A single-hander was also a little bit simpler and therefore cheaper to make. However by this time the two-handed clock was well understood and was the norm in longcases (certainly for those longcases made in London for 'gentlemen'). It is not surprising therefore that a London example of an alarm clock of this period has two hands. At this date the more sophisticated traveller would probably have been embarrassed to be seen carrying an alarm clock of the old-fashioned one-handed variety. Strictly speaking 'clock' is the term used for a clock that strikes the hours. An alarm clock (whether a travelling version such as this or a larger 'static' one) was usually NOT required to strike, as it would keep the owner awake. A clock such as this is therefore more correctly called a travelling alarm timepiece (timepiece being the term for a non-striking clock). But in fact most of us today would call it a miniature travelling lantern clock, because we know full well that these 'travelling' clocks don't strike. Even though this term is not strictly correct, we all know what we mean. In fact even the word 'miniature' is almost superfluous because travelling alarms are miniatures. This kind of clock was made from about 1730 to about 1780, after which the simpler hook-and-spike form had taken over. By 1730 ordinary lantern clocks were regarded as old-fashioned by London makers, though not so the travelling alarm versions. Examples of miniature travelling alarm clocks are known by some of the finest makers in the land, who were after all making travelling clocks for gentlemen, the same gentlemen for whom they made their more usual domestic clocks. Such makers as George Graham, Daniel Quare, Joseph Windmills, amongst others. Some of the earlier travelling ones take the normal form with the rounded lantern dial, but by 1730 the majority have arched dials, like this one. Provincial examples from the second half of the eighteenth century are more common than London-made ones. Those by London makers are relatively scarce and therefore highly regarded.